A bad grade might sting for a semester, but a failing audit score could shut your food manufacturing facility down for good. From the all-you-can-eat scraps buffet to the countless nesting spots, it should come as no surprise that pests love to frequent these areas. But being aware of the threat isn’t enough to make the grade. Whether you’ve been getting by on luck alone or already have a robust IPM program, everyone could use a refresher course. The American Cockroach and his friends in the infamous Rodentia clique may get a lot of attention, but they’re not the only pests causing problems. Learn who the other culprits are, where like they hang out and why they’re trouble. Once you know what you’re looking for, it’s time to teach them a lesson. Learn about common entry points and how to stop pests from sneaking past your defenses to balancing. With the perimeter secure, turn your attention to cleaning up the interior. Follow our sanitation checklist, and you’ll be on your way to passing the next audit with flying colors. Last but not least, you’ll learn the value of documenting pest management. And yes, that means taking notes. Armed with this information, you’ll be ready for the real test – your next audit. But it’s not just about making the grade for regulators. A top-notch IPM program can protect you from other bad marks, including negative online reviews and litigious customers. 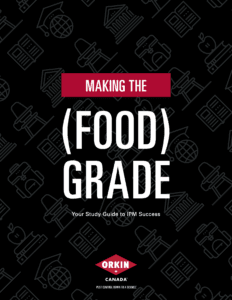 So, if you’re ready to level up your pest management program, download “Making the (Food) Grade” right now.